Still waiting for the Wedding Bells to ring? Ask Our Experts! 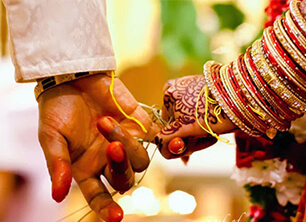 Anxious to know about the time of your matrimonial union? Well relax, we are here to answer all your queries! The ancient and divine science of Vedic Astrology, since times immemorial, is making astounding predictions and revelations about each & every aspect of ones life, especially marriage. The only effort that a native has to make is consult an experienced astrologer for an in-depth analysis of his/her horoscope. Getting a Personalized Marriage Report would tell you exactly what the stars have in store for you! Revelation of strong time periods when marriage is most likely to take place. It makes incredibly accurate predictions about the timing of marriage. It filters the results of both benefic and malefic Planets & Star Lords on the event of ones marriage. Based on the results, it suggests powerful and super effcient remedies to counter & nullify delay in marriage. It also tells the strength of an horoscope when it come to the nature of marriage i.e. Love or Arranged.